Haaretz, YNET, NRG...everyone's reporting it today. Residents of Jaffa reported on Monday morning that vandals set fire to an Arab-owned restaurant on Yefet Street in the city. According to a Tel Aviv-Jaffa city council member, the phrases "price tag" and "Kahane was right" were scrawled on walls at the location. Police were called to the Abu el-Abed restaurant on Yefet Street and opened an investigation into the incident. This week, 20 olive trees belonging to an Arab family in East Jerusalem were cut down. A sign was found at the scene that read in large letters "price tag". Earlier this month, two cemeteries in Jaffa were desecrated. Headstones were smashed and racist slogans were spray-painted on graves. The two cemeteries, one Muslim and the other Christian, were vandalized with graffiti that said “Death to the Arabs”, and “price tag”. "Abu Alabaz - 1949 - Palestinian-Lebanese Kitchen and Catering"
What Haaretz failed to report, was that in the previous cemetery desecration in Jaffa this month, the police were pretty sure that Football hooligan fans were responsible -- "Police said the incident was "linked to a soccer group," and that they were not convinced it was carried out by right-wing elements. (JPost)"
Yet that's not all. The Al-Arab website had pictures of the atrocities...and plenty of invective against the alleged price-taggers. 99.9% of the settler movement is disgusted by vandalism...routinely suspecting them for alleged "price-tagging" is just as odious. And its getting boring already. Helping keep the world safe for the rest of us, the IDF reduced the world's population to below the 7 billion mark by eliminating 2 Palestinian terrorists in Gaza who were intent on shooting rockets at Israeli civilians in Southern Israel. "IAF aircraft attacked a terrorist cell in the southern Gaza Strip which used high-trajectory weapons against Israel," a statement issued by the IDF Spokesperson's Office said. Palestinian sources in the Strip confirmed that the IDF attacked east of Khan Yunis but initially claimed the cell was not hit. Later, it was confirmed that two members of the Al-Ahrar movement's military wing were killed in the strike. The Palestinians reported that medical teams found the bodies of two terrorists on Monday morning. "They did not die in vain, the national consensus on the lull won't prevent us from taking revenge and retaliating for these ongoing crimes," the movement said. I guess we'll hit 7 billion later...and we can hope the IDF keeps taking out the Palestinian terrorists before they manage to launch more attacks on us. 12:2o AM IDF has attacked Islamic University near Khan Yunis; Palestinians report number of wounded. 12:19 AM 5 Rockets launched at Israel in the past 20 minutes. No injuries reported. 12:18 AM Rocket lands in open area. No injuries or damage reported. 12:17 AM Color Red warning sirens in Kfar Maimon and Tooshiya. Incoming rockets. 12:16 AM IDF retaliating against multiple targets in Gaza. No reports of injuries in previous minutes' attack from Gaza. 12:14 AM Color Red warnings in Sedot Negev; incoming rockets launched. Kfar Aza, Eshkol Region, Ashkelon, Shaar HaNegev Region, and more. Another week....another barrage of rockets. Since last Wednesday, Israel has been rocketed again and again by Gaza. 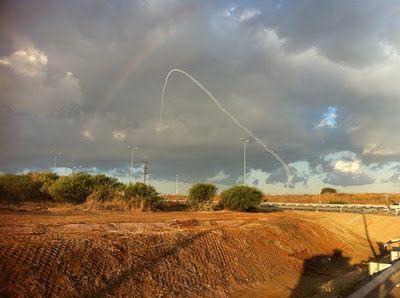 Shabbat was particularly bad, as GRAD rockets were fired at Ashdod, Asheklon,http://www.blogger.com/img/blank.gif Gan Yavneh, Beer Sheva...some direct hits took place as well. As of this morning, over 24 rockets have been launched at Israel from Gaza since Shabbat morning. August 9, 2001; 1:55 PM. 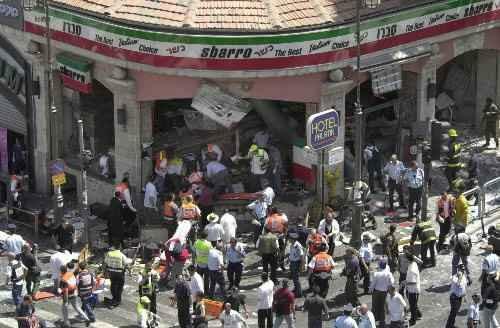 A Palestinian Suicide Bomber entered the Sbarro Pizza restaurant at Jerusalem's busiest intersection (the corner of King George Street and Jaffa Road) and detonated a bomb containing 5-10 kilo of explosives, nails, nuts and bolts -- 15 civilians were killed and 130 wounded. 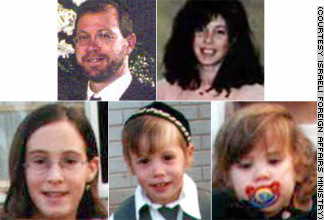 Among those killed were the parents of the Schijveschuurder family from the Neria community: Mordechai (43), his wife Tzira (41) and 3 of their children; Ra'aya (14), Avraham Yitzhak, (4), and Hemda aged 2. The TV program documented ten years of failure by all of Israel's systems, to adequately care of the orphaned children - social services, Bituach Leumi (Social security) and the educational system. They fell into a non-existent category and no-one seems to have had the presence of mind to work around that. The program began with a little biographical detail about the family - olim from Holland. It then moved on to the actual terror attack itself. The three older boys, Ben Tzion (who now lives abroad), Meir and Shvuel were not present. Ben Tzion and Meir were both in the army and Shvuel (who was 16.5 at the time) was on his way back from the Klezmer festival in Tzfat. The program documented their search for the members of their family in various hospitals, without any outside help from any State service. As Meir did not have any ID proving his connection to one of his sisters, he was not allowed to see her as she lay dying in the operating room, yet minutes later was asked to identify her body. 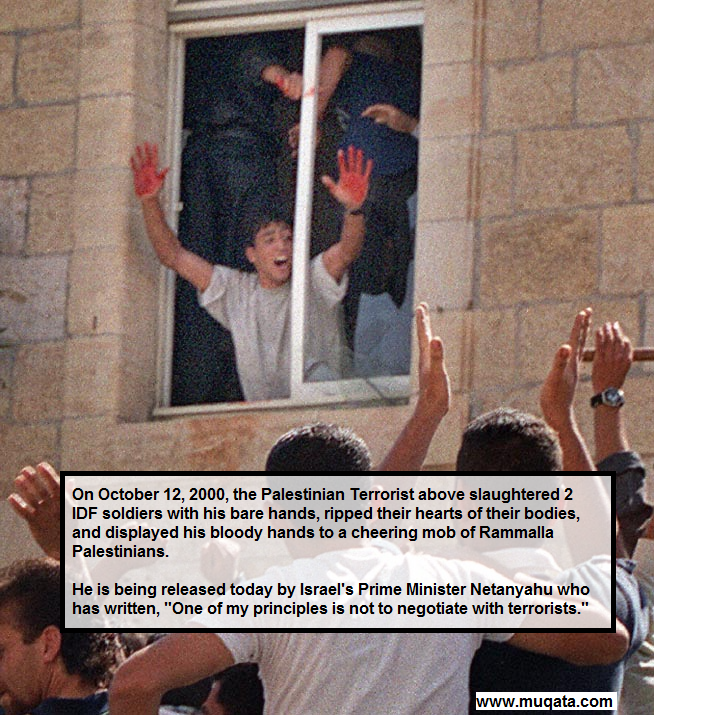 Meir, an 18/19 year old, ended up organizing the funerals all by himself. The Jerusalem Hevra Kadisha (Burial Society) even had the gall to demand money from him (20,000 shekels - later returned) for two additional burial plots, stating that he could only have three (he had to bury 5 members of his family). He and his older brother took care of the younger surviving children (the youngest was 8) in the family home with no outside help. At some point the social services tried to take the two younger girls into care, but they objected. Afterwards the girls were sent to live with a distant relative in Switzerland for about a year, but were very unhappy there and came back to Israel. Later they were sent to live with another distant relative in Israel, but that didn't last long either and Meir and his wife took them in, whilst also raising their own young family. Shvuel seems to have 'fallen between the chairs' perhaps most of all. He is obviously in need of psychological help, and clearly knows that himself, but his attempts to get that help from Bituach Leumi have been rejected. The program ended with a 'right of reply' statement from Bituach Leumi which the presenters said they had fact checked and found to be lacking on certain points. Apparently there is a serious problem with people who, as children, lost both parents in terror attacks. (A lady orphaned by the Ma'ale Akrabim masscare briefly mentioned similar problems, and the issue was raised regarding the Fogel family). The system does not cater for them properly and seems to work on the premise that they will be taken care of by the extended family, but in this case there was not much extended family to help. There is an attempt ongoing to try to change the law, but it is clear that this family has already sustained far too much damage because of the system's shortcomings. And then...comes the final blow. The terrorists who planned the attack, go free. Translated from Channel 2. After they realized their lost battle, the Schijveschuurder family went to the graves of their loved ones - to tell them that those responsible for their murder, are now free. "We have every intention and desire to take what you see here, break the headstones, remove the remains buried here and take them outside the country who betrayed them," says Meir Schijveschuurder -- his parents and three siblings were killed in the attack at the Sbarro restaurant. "Because the State of Israel betrayed everyone who lies here and there are several hundred of them, only in this area [of the cemetery]." The Schijveschuurder family, originally from Holland, is one of the families that has paid the heaviest price in the history of terrorism against the State of Israel. 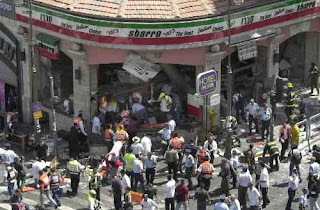 Two parents and three of their children were killed in the attack at the Sbarro restaurant, and two other children were seriously injured. When Meir Schijveschuurder learned this week that those who planned the attack, drove the terrorist to Sbarro, and were now released from prison, the son desecrated the monument in memory of Yitzhak Rabin in Tel Aviv in protest. He was arrested and released. The children tried to appeal their arguments to the Supreme Court, but were also rejected. The brothers say the High Court's ruling was predetermined before hearing any of their claims. "We will not allow terrorists to leave the country! And if they leave the boundaries of the country, the residents of the United States and United Kingdom should know that Israel betrays its population," said Shvuel angrily. "I lost faith in everything that I felt"
Regaining his composure, Shvuel promised he would avenge the death of his family. "Unfortunately the State of Israel has a bankrupt legal and ethical system, and they have abandoned the issue of upholding justice for the killers and murderers of my parents -- to me. A victim of a crime has the right to go to make a "price tag" for those who committed the crime and punish him, [when the system doesn't do anything]" says Shvuel. Former Prime Minister Ariel Sharon promised the brothers that the murderers would rot in jail until the end of their days, but that promise was broken today. "I feel like I was exploding all over again. I feel that what we built over the past 10 years and everything we've been able to constructively do with our bereavement -- I feel that everything we did in those 10 years, rebuilding our lives, is just in vain. Now I lost faith in anything, everything I felt," says Leah Schijveschuurder, the youngest sister, sadly. The family is very hurt by the atmosphere of joy and jubilation that enveloped the nation in recent days. It would be better that the Shalit family celebrate quietly in their house -- this festival going on is so difficult for us. As of the writing of this blog post, the orphans of the Schijveschuurder family have announced they are leaving Israel to Holland within 2 months -- during the Makor program, one point one of the daughters cut her Teudat Zehut, her ID card into pieces telling one of the children that she did not need it anymore. The Schijveschuurder family has been betrayed by Israel; the Palestinian terrorists have won this battle. They physically slaughtered a family, their terrorists were released from prison, they gleefully watched the State ignore the remaining orphans...and cheer as the broken spirits plan to leave forever. "I write to you with a heavy heart," Netanyahu said in an open letter to the families of terror victims. "I understand and know your pain." Writing that he lost his brother in an operation to free hostages, Netanyahu said, "I know that you have a heavy heart, that your wounds have been opened anew these past days; that your thoughts are not at ease." Netanyahu said the families "were in my thoughts” during the painful decision-making process and negotiations for Schalit’s return." "The decision regarding the release of Gilad Schalit was among the most difficult I have made," he wrote. "It is difficult for me for the same reasons it is difficult for you." 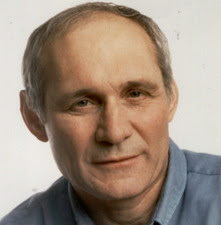 Meir Schijveschuurder said that to the best of his knowledge, only 200 letters were send out to families of terror victims, explaining the Shalit deal. The Schijveschuurder orphans did not receive any letter. Nor were they contacted by any government official during the period before and after the Shalit deal. I like Sefer Breishit, and most particular the entire Creation story. To me it’s the most fascinating, deep, and secretive section of the entire Torah. You can keep rereading it and discover something new each time. If you get a chance, I recommend reading Gerald Schroeder’s The Science of God to see how he sees the science and religious narratives converging. I also started rereading Alan Dershowitz’s The Genesis of Justice where he discusses the evolution of morality and justice in Sefer Breishit. It’s fascinating. Dershowitz raises some interesting questions, such as, how could God could change his punishment after threatening them with death? How could they have been held liable without any internal moral understanding? How could Eve have been guilty of anything when she was explicitly told that touching the tree would kill her, and it didn’t, so if statement 1 was a lie, then presumably statement 2 was a lie too. And why should their descendents (us) be punished for their actions? As a result of these questions, I started thinking about it some more and it occurred to me last night that maybe they weren’t actually punished, but in reality, rewarded for what they did. Let’s consider their Utopia in Eden. Adam and Eve had eternal life, they had no responsibilities, everything was handed to them on a silver platter. They didn't even have to date. I don’t know about you, but in Genesis 3:22 (after the sin) God says man is now like them, knowing the difference between Good and Evil, and if they eat the Tree of Life they’ll live forever. Yet if you compare them to traditional Greek mythology, pre-Sin Adam was about as godlike as you can get, eternal life, no worries, no responsibilities, a woman given to him, everything handed to him on a silver platter. God is saying that mortal Adam with understanding is Godlike, not immortal Adam. So clearly in Jewish thought, morality and understanding are close to Godliness, and not eternal life and power. So going back to my original premise, why do I now suspect that God’s punishment of Adam was actually a reward? It has to do with the whole basis of pre-Sin Adam’s existence. Before the Sin, Adam’s life had no intrinsic value. He would live comfortably forever without ever having to do anything. Sure he was told to tend the garden and name the animals, but there is no indication that in failing to do so his life would be any worse off – after all, there were no thorns or thistles to deal with, and the ground wasn’t cursed to need tending. His food would still be there and his life would be good. In short, Adam could have (literally) lived forever, (figuratively) sitting on a couch in front of the TV accomplishing nothing for all of eternity. What did God’s punishment do? It did two very significant things. One (in reverse order) – it set a deadline. If Adam was to accomplish anything with his life, he couldn’t put it off until the next millennia, he had to take action now. But why would Adam want to accomplish anything with his life? That is part 2 of the punishment (part 1 actually), now he had to work to eat, work hard very hard in fact. What this punishment did was create a value for his labor, something that simply did not exist in Eden. Adam now how to invest time and effort to eat and be comfortable. The second half was putting a value on his life, the specific amount of time he had to accomplish anything, again, a value that simply did not exist in Eden. The “punishment” actually removed Adam from a seemingly utopian life – a completely meaningless, pointless existence, and replaced it with one where his life and his work could gain intrinsic value. Before his job of tending the garden was superfluous and meaningless. Now, it actually would change something and was dependent on him. His actions now had meaning and value. To me, that sounds like a reward, not a punishment at all. As for Eve, it’s the same thing. Her job, creating life in Eden was easy, mostly painless and completely meaningless. Now (like Adam’s job) there is time, effort, and pain involved. Suddenly creating life involves an investment and a price, and like for Adam that creates intrinsic value. In short, the pain of childbirth created the basis for child-rearing to actually have a value. What looks like a punishment is actually a reward. I’m definitely not going to explain why or whether this is a reward or a punishment (or maybe a correction) because all the girls feminists here will start virulently attacking me and the discussion will go off-topic again like last time. 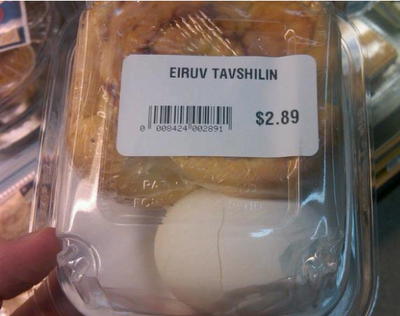 Anyway, that's my Chiddush this year for the story of Creation. I'd like your feedback. Here is the explanation regarding the other part of the Woman's punishment. Edenic Adam values his relationship with Eve. He was lonely before, and now he isn't. That's why he is drawn to her. Edenic Eve on the other hand doesn't value the relationship. Like everything else in the garden it was always there and always will be, and therefore she doesn't and can't appreciate Adam's value or that of a relationship. So like the other punishments (rewards), there is a gain of intrinsic value, but always with a price. Eve is now drawn to Adam, because she will now recognize and value the relationship and desire it. But the price for recognizing that value and obtaining that relationship is that she becomes vulnerable to Adam's demands, and needs to acquiesce to them. This actually brings me to a final point. It could perhaps be read that the Tree was not the Tree of Good and Evil, but rather the Tree of Good and Bad. Perhaps Adam didn't gain an understanding of Morality from the Tree, but instead gained an understanding of Comparative Value from the Tree . How to compare. What is worth more, and what is worth less. The ability to look at something through critical eyes, which is why they were embarrassed at their nakedness, and why Adam expresses his disappointment and blame with the Woman (who wasn't perfect in the end). It may very well be that the Punishments weren't punishments at all, just the natural result of man gaining an inherent understanding of what is more valuable, and what is not. The ability to critique and compare. Childbirth hurt just as much, but now Eve could compare it to not being in pain. Man actually had to work for food, but now he understood how hard working for it really is. The thorns and thistles were there before, but now he actually paid attention to them. Perhaps Nature didn’t change. Man's perception did. Peace Now has called on the Prime Minister to immediately remove from the Knesset's agenda any discussion about the initiative to free Arab prisoners within the framework the the Shalit Deal. "The deal is difficult enough for Israel, and there is no reason to add additional risk to Israel's citizen's by releasing Arab terrorists to the streets," said Peace Now's Director, Yariv Oppenheimer. The left's proposal is immoral and represents a warped worldview that allows attacking and killing Jews. NRG-Maariv. Interesting to see a moral position from Peace Now about the legitimacy of releasing terrorists. I would think that the only way to add any morality to the release of Arab murderers, would be to release Jewish ones as well. When a murderer is sentenced to 36 life sentences but is being released after barely eight years, it becomes clear that verdicts around here are not binding. The judges wrote something, so what? For lack of other choice, what is left to do now is to at least adhere to the principle of equality before the law, or more accurately, equality before the absence of law. A mass release of Arab terrorists requires us to embark on a parallel release of Jewish security prisoners. It isn’t nice and it isn’t pretty, but it’s necessary. If Israel is strong enough to cope with the release of 1,000 Hamas members, [Jameel adds; actually, they were also from Fatah, and some were Israeli Arabs] it is also strong enough to contend with the mitigated sentences of Jews who harmed Arabs. In this case we are not dealing with 1,000 prisoners, and not even with 450, but rather, with only 12 of them. As opposed to the Arab prisoners released in the swap, believe me when I say that there is no danger that the freed Jewish inmates would ever take up arms again. The overwhelming majority spent a much longer period in jail than most of the recently freed archenemies sent to Judea and Samaria or to Gaza. Ami Popper has been behind bars for much longer than the female terrorist behind the Sbarro restraint bombing, while members of the Bat Ayin underground were imprisoned many years before the architect of the Café Moment bombing. Other prisoners include soldiers and police officers whose actions marked a momentary lapse, rather than the result of a lengthy conspiracy or membership in a subversive group. Attempting to spin up more internal strife in Israel, Haaretz lets loose with another anti-religious article, designed to make your blood boil...and "cleverly" contrast previously reported "anti-feminist" behavior by religious soldiers in the IDF. I've highlighted in bold a few key phrases and sentences. About 100 female soldiers left the main celebration sponsored by the Israel Defense Forces marking the end of the Simhat Torah holiday on Thursday after they were asked to move to a separate women's section. The traditional "Hakafot Shniyot" event, which comes after the holiday's formal conclusion and includes dancing with the Torah, was held in the Eshkol regional council area in the south. The commanders of the women soldiers decided to have the women board buses and leave after some objected to their being directed to a separate area cut off from the main event. The separate women's section was set off by cloth sheeting, but according to one of those present "it was very hard to feel connected to the event there." The event was attended by about 500 people, including a mix of civilians and soldiers, among them, about 100 women soldiers. Those in attendance said before the request was made for them to move, the women had been dancing at one side, separately from the men and also separated by a long table. 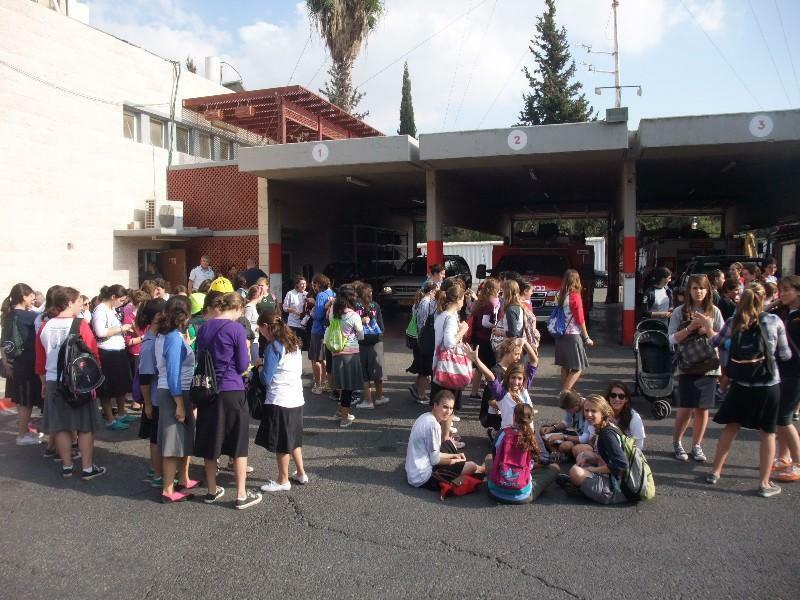 The women soldiers were then ordered by an officer from the military rabbinate to go to a separate, closed area about 50 meters away, following complaints over the initial setup. Orthodox Jewish religious authorities call for separation of men and women in certain circumstances. For many observant Jews in Israel, however, it is the custom for men and women at Hakafot Shniyot to dance separately but without the women being relegated to another designated area. The IDF's chief rabbi, Rafi Peretz, as well as the commander for the IDF's Gaza division, Yossi Bachar, were present but did not intervene in the matter. The rabbinate has been under pressure recently to adopt strict interpretations of halakha, Jewish religious law. 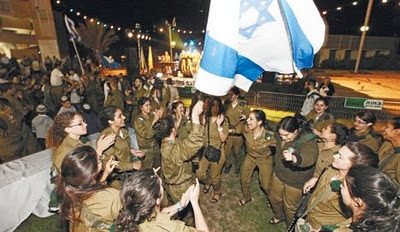 "[Haaretz Reporter] Anshel Pfeffer wrote an article in Haaretz with a headline that hundreds of Female IDF soldiers angrily left a Simchat Torah event after being forced to celebrate in a segregated area. This is a lie and absolutely false. 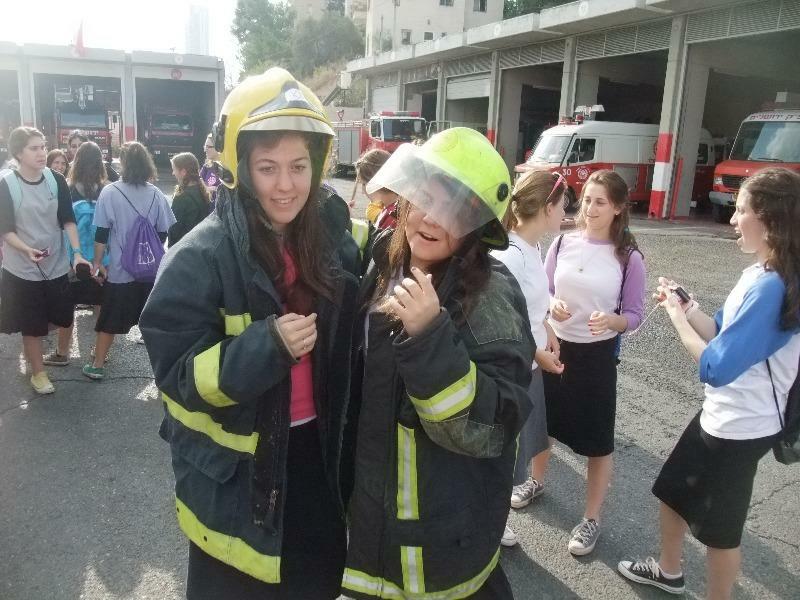 I am a female IDF solider that was there in the Eskol Regional Council [at the Simchat Torah event]. The seperation was via long tables, which were regular table height, and they had food and refreshments on them. We all danced in merriment. No one thought there was an issue to mix the sides, because the dancing was similar to the hakafot (Simcaht Torah dancing) in a synagogue and not one of us [who were dancing] left. There were some "Ashkenazi" soldiers who left because the event didn't interest them...and if anything, there was about 30 of them that left, not "hundreds". Update: Israel's Channel 2 TV can't resist quoting a great anti-religious story, and reprints the Haaretz story almost word for word. Fact checkers need not apply. Failed Palestinian underwear suicide bomber, Wafa al-Bis who was released from an Israeli prison last week insisted she would seize any opportunity to mount another suicide mission against the Jewish State, and she encouraged dozens of cheering Palestinian schoolchildren to follow her example. Her target, Israel says, was a hospital where she had been given permission to seek treatment for burns she sustained in a gas tank explosion. She never got there. Stopped by suspicious Israeli soldiers at a checkpoint on Gaza’s border, she was discovered with 22lb of explosives sewn into a belt inside her underwear. Bis tried to blow herself up but the detonator malfunctioned. Speaking in her bedroom, the shelves of which were lined with soft toys, Bis yesterday maintained that the six years she spent in an Israeli prison cell had left her with no regrets other than her failure to kill herself and her captors, although she insisted that her target was only ever going to be a military one. Bis’s mother Salma said she had no idea of her daughter’s mission — but added that she felt she had no choice but to encourage her in her chosen course of life. “This is Jihad, it is an honourable thing and I am proud of her,” she said. Note the pathetic attempts of the Huffington Post to garner sympathy for poor Wafa, who has been banished to Gaza (to prevent her from easily attempting yet another suicide attack). Here's to hoping she manages to blow herself up in a work-related accident, taking throngs of her Jihad-cheering supporters and family along with her. Update: Yet another freed terrorist announces her desire to continue to commit terror attacks against Jews. "No Regrets, I'd do it again..."
AMMONNEWS - The former released Jordanian prisoner, Ahlam Tamimi called on the Arab youth to continue pressuring their governments for keeping their efforts in using the Palestinian prisoners file as an important pressure element in any negotiations policy with Israel. While we may argue over the incredibly heavy price we paid for Gilad Shalit (and hopefully, without compound interest), one simply must welcome home Gilad with open arms, and a warm embrace...wishing him a Chag Sameach, Welcome Home, and expressing the feeling of "Am Yisrael Chai". This morning at 2:30 AM, was the official start of the "Day of the Swine" -- as 477 murderous Palestinian, Islamic animals are being released from their pens. These swine who have butchered civilian men and women, boys and girls, and tiny infants in the name of Islam and Palestine, these worthless representatives of a fake collective called "Palestine", whose biggest claim to fame is their lack of a positive contribution to the human race, are preparing for a hero's welcome by their fellow animals. Any Muslim, any Imam, any Muslic cleric who does not hang their head in shame at the release of these butchers -- over a thousand by the end of the exchange deal for kidnapped IDF soldier Gilad Shalit, is also part of the herd of swine. How do they not weep that this exchange proves beyond a shadow of a doubt that the absolute value of a single Jew is worth more than over thousand of their fellow co-religionists? Islamic apologists point of the invention of the "zero" as one of the great contributions of Islam to the world. Today we see over a thousand zeros -- a thousand murderous animals, filthy swine being released, as Palestinians celebrate. Collectively, they are even too stupid to even realize that this exchange minimizes their own self value. There will never be peace with the Palestinian people. Any person who cheers this release will never desire peace, will never want peace, and cannot comprehend the concept of peace. The butchers released today, their mobs of supporters, and every Islamic leader who does not denounce them, will rot in hell for eternity. This past year Israel faced an incredibly serious threat, a number of them actually. Yet September came and went, and no disaster fell upon is despite vocal cries of the upcoming Tsunami. The threats were real. September was very real. Even more real and dangerous than the general public knows. But Hashem doesn't turn away a prayer that comes from deep within. Because of the very real threat we faced, in our fear, we the nation increased our prayers, our depth, our concern expressed in those T'fillot, and as a result Hashem listened. 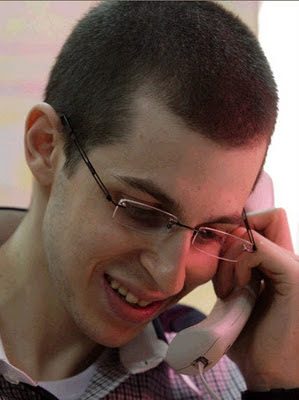 Hopefully our prayers are also helping to free Gilad Shalit soon. And that is a wonderful thing. An important thing. But his coming home is coming with an awful, horrible price that the nation will have to face. And we'll need to increase our prayers in response to this, to protect us more. In was inevitable, that unless Israel launched a rescue operation, or started taking more aggressive steps against our enemy that this was the price we were going to eventually pay once Hamas decided it was ready to make a deal (assuming it happens). And I think the Chief Rabbi summed it up succinctly. Getting Gilad Shalit back is important for Gilad and important for the nation. But it's now up to us to pray harder to protect us from what comes next as a result of this horrible deal. 1) I hope that Jews, including those in America will come to settle in Hebron and around it. 2) Jews have complete rights in this land, to live in Gush Etzion and Har Hebron in its entirety. 3) If we manage to create a massive Aliyah [to the territories], we will be able to keep this land whole, like it was. 4) There never was a Palestinian state, and the Arabs that conquered the land never developed anything. 5) I would never give a command to destroy any settlement in the territories. 6) We need to increase pace, and spread more settlements across the map. 1) Who gave 10% of his pension to the Rabbi Levinger’s yeshiva in Hebron? Answers to these 6 quotes after Shabbat. I was abroad for a bit and didn't have time to blog about this particular, important issue, but didn't want it to pass by without any comment. This past Sunday evening, someone torched a Bedouin Mosque in the Northern Israel town of "Tuba Zanghariya." Someone left behind some graffiti as well, indicating the arson attack was a "price tag" retaliation for the murder of the Palmers by Palestinian terrorists on Erev Rosh HaShana. “What I can’t understand is why us? Why of all places would they come here?” asked resident Dr. Muhammad al-Haib, in a plaza outside the scorched entryway of the al-Noor mosque. In a common sentiment expressed Tuesday, al-Haib said the people of the village are “completely Israeli” and see themselves as having a shared fate with their Jewish neighbors in the surrounding towns. Al-Haib said the villagers celebrate Independence Day and do not identify with the “Nakba,” the Palestinian day that mourns the founding of the State of Israel. Like others, al-Haib also expressed a sense of bewilderment and surprise at the suspected arson, rather than a desire for revenge. 1. Torching a Mosque, or any house of worship is wrong. Burning down a mosque makes you no different that the Nazis who burned down synagogues on Krystalnacht and during the Holocaust, and no different than the Palestinian mobs who burned down the synagogues in Gush Katif after the Disengagement. No difference than the Palestinian barbarians who spray pained swastikas on Kever Yosef-Jospeh's Tomb yesterday. It's wrong. 2. Revenge by individuals cannot be tolerated. The State of Israel via the IDF and Security forces is responsible for deterrence, retaliation and revenge. They need to hunt down terrorists, and scare our enemies to the point that they won't dare attack a single Jew. 3. This statement is not apologetic, nor the result of leftwing pressure. The Muqata Blog receives zero funding or advertising from left-wing organizations or the New Israel Fund. This statement is being made because its wrong to burn down Mosques. Now, having made the above statement, I would like address some of the surrounding issues. Israeli politicians have been using the above attack as an excuse to attack the right wing in Israel and wax poetic about how the attack directly goes to the heart of Israel as a Jewish and democratic state. Opposition leader Tzipi Livni commented on the incident, saying that if it was indeed a "price tag" act, then it must be condemned. Unlike Tzippi Livni, we at the Muqata don't say that "if it were indeed a "price tag" act, then it must be condemned" -- we say clearly, that regardless of WHO did this act, it must be condemned, not only if it was a "price tag" action. Unlike Tzipi Livni, who runs to mention the Mosque arson attack, she has no condemnation or even a comment about the murder of Asher Palmer and infant son Yehonatan a week earlier -- remember, the arson attack said it was retaliation for the Palmer murder. (Livni's official website and facebook feed have zero mention of it at all). The Muqata condemns the murder of Jews and publicizes the issue because its important for people to know that Palestinian terrorism is continuing...and the murder of Jews should always be publicized. Livni only finds the time to quasi condemn the Mosque arson attack. The same goes for Israel's president, Shimon Peres. Our outspoken President also neglected to even mention the murder of the Palmers, and while he's full of shame at the mosque arson attack, there is not one word of mention of the murder of the Palmers -- not on the entire Presidential web-site. It goes without saying that the 972mag website condemns the mosque arson (Larry Derfner writing about "settler violence" -- surprised? ), yet its perfectly abhorent that 972mag totally ignores murder of Jews by Palestinians...and the name "Asher Palmer" doesn't appear anywhere on their website. That's the difference between the Muqata and 972mag. We condemn and publicize the murder of Jews by Palestinian terrorists, and make sure you read about it. We also condemn the arson of mosques. And mosque arson is wrong, regardless if carried out by Jewish Israelis...or by 3 Arabs from Hebron. 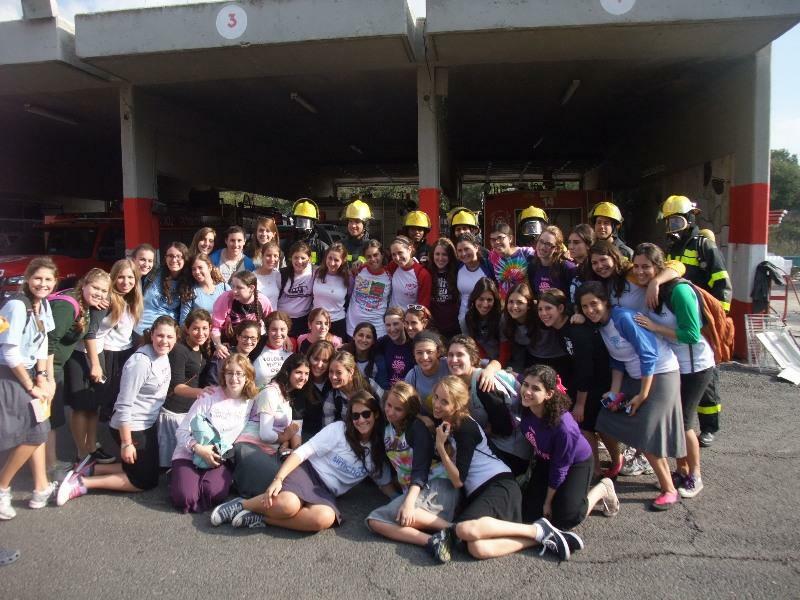 This past Monday (October 3rd) young women from the Shaalvim Women's Seminary visited Jerusalem's central fire-department to volunteer for a few hours to help out at the fire-station. 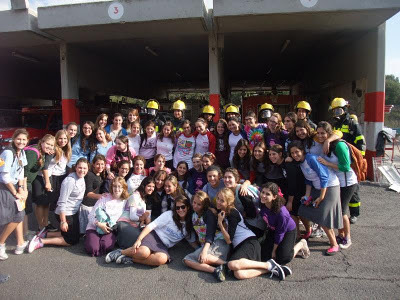 The group of 75 volunteers come from the USA, Canada and England and are studying at Shaalvim. Within the framework of their studies, the women also volunteer for all sorts of chessed/charity work. So many things going on...here's a quick roundup. 1. The sad news of the day, is that Rav Hanan Porat died last night. At the funeral for former MK Hanan Porat on Wednesday, Knesset Speaker Reuven Rivlin eulogized the Gush Emunim leader, calling Porat "a visionary and an achiever, a poet and a fighter." "You knew how to be the public's agent whose mouth was full of song, to be a sharp parliamentarian with a dreaming soul," Rivlin said. "Within your soul there was a great love, a conquering love, for the national of Israel, for the ground of this good land, for Israel's Torah." "Your voice, Hanan, was silenced," he concluded, "but the voice of your song will still lead, with your mighty love, this nation and this land for many years. I came to say goodbye on behalf of the Knesset and the Israeli nation. You will be missed greatly." 4. 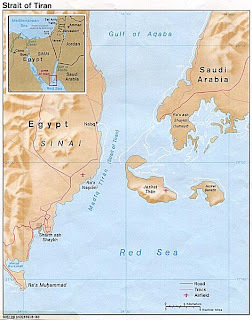 Iran Press reports that Israel has been secretly occupying the Sanafir Island in the Red Sea since 1967, with the approval of Saudi Arabia. Saudi Arabia and the Western states have kept silent for decades regarding the occupation of two Saudi western islands by the Israeli regime. Israeli forces reportedly occupied Saudi Arabia's Tiran and Sanafir Islands in 1967. The two islands are located at the southern end of the Gulf of Aqaba, leading to the Red Sea. Tiran Island, which has an area of about 80 square kilometers, is located at the inflow of the Straits of Tiran. Sanafir Island, with an area of 33 square kilometers, also lies to the east of Tiran. The two islands were given to the former Egyptian President Gamal Abdel Nasser for logistics use in the Six Day War of 1967 against Israeli forces. However, the islands have been occupied by Tel Aviv since Egypt's defeat. The Straits of Tiran, which has remained under the control of Tel Aviv, has strategic significance since it serves as Israel's only direct access to the Red Sea. What is interesting about this story, is that it appears previously over a year ago in the MiddleEast Monitor...with many more details. In a meeting with Turkish Foreign Minister Ahmet Davutoglu, Assad said: "If a crazy measure is taken against Damascus, I will need not more than six hours to transfer hundreds of rockets and missiles to the Golan Heights to fire them at Tel Aviv." 7. 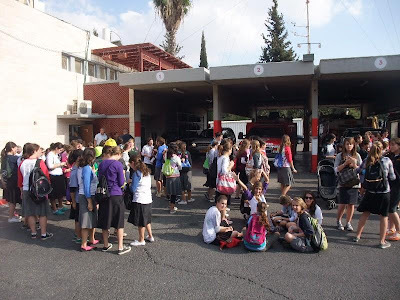 Will be writing a post soon about the Mosque Arson in Northern Israel, allegedly a Jewish revenge "price-tag" attack. I left Israel the other day for a quick 24 hour business trip. On my way out, after passport control before going down the ramp to duty free, there is one more security check, where your passport/ticket are examined (or a piece of paper is given in). To tourists visiting Israel: "Thank you for visiting, we hope you had a great trip"
to the Israeli teenager: "Have a fun time abroad!" Personalized service to every departing traveler -- with a smile! What is the Obama Administration's deal with Pollard? WASHINGTON — In the middle of a meeting with 15 rabbis in Boca Raton, Fla., last week, Vice President Joseph R. Biden Jr. took a punch meant for his boss. One of the rabbis asked why Jonathan Pollard, the Israeli spy convicted in 1986, was still in prison. Mr. Biden, on a mission to shore up support for President Obama, replied forcefully, according to several people at the meeting. Yet, who is really speaking? Is Biden really against the release of Pollard? By flip-flopping back and forth, and contradicting each other's position, its hard to know what the real story is, and what the US Administration's real position is on Pollard. Regardless, he he more than served his time, and should be allowed to come home to Israel. Not one "spy" against the USA has ever served such a harsh prison term...and this is from a friendly country. This year, grant clemency for Pollard!